The first week of July is over, and with it the frenzied, insane stage of NBA free agency. Outside of one very important player, pretty much every major free agent has signed. And even though many players simply re-signed with their old teams, the NBA landscape still underwent rapid succession. When free agency began with Al-Farouq Aminu signing with Portland, he was going to a Blazers team that was still a contender. 120 hours later, Portland looks like a 25 win team, and is returning just one starter. Such is the way during this time of year. But onto my favorite, and least favorite moves and trends of free agency, starting with the obvious. It would've been way too simple to make this "Spurs sign LaMarcus Aldridge." Their offseason dominance goes well beyond one marquee signing. On the first day of free agency, they re-signed both Danny Green and Kawhi Leonard, and also shipped Tiago Splitter to Atlanta in order to free up cap room. Three days later when Aldridge announced he was headed to San Antonio, we could have crowned the Spurs offseason champions in that moment. But they were far from finished, convincing Manu Ginobili to give one more season, and then luring David West for the veteran's minimum. Read that last one again. He turned down a $12.6 million player option from Indiana to sign a $1.4 million deal in San Antonio. I don't care what you say about tax breaks in Texas, that's an insane sacrifice. But such is the way of the Spurs, who roll into the 2016 season with the best starting 5 in the league, and a loaded, Spursian bench. For Aldridge, this was the perfect decision. He will replace Tiago Splitter in the starting lineup, giving the Spurs another floor spacer. His newfound three-point shot (he made 37 last season after making 24 the previous eight) will mitigate any concerns surrounding his post-up game. He's also a far more adept passer than many give him credit for, and can play small-ball 5 alongside Boris Diaw and Kawhi in the front-court. No matter what, anyone trying to poke holes in this deal is just being contrarian. Poppovich will get the most out of Aldridge, and the Spurs have upgraded from Tiago to LaMarcus. When you make it that simple, it's easy to realize why the Spurs are considered Western Conference favorites. When Jimmy Butler boldly announced he wanted a one-year deal so he could re-enter free agency when the cap increases, it looked like this might set a new trend amongst RFA's. They would bet on themselves, and take the shortest possible deals they could. But when free agency started, every marquee RFA smartly took the money on the table. While many fans might think that they should've manipulated their free agency until the cap goes up, that would be incredibly risky. Considering RFA's are coming off tiny rookie deals, they all got their guarenteed money when they could. Bet on yourself after you've bagged $80 million, not before. This was a deep class of restricted free agents. 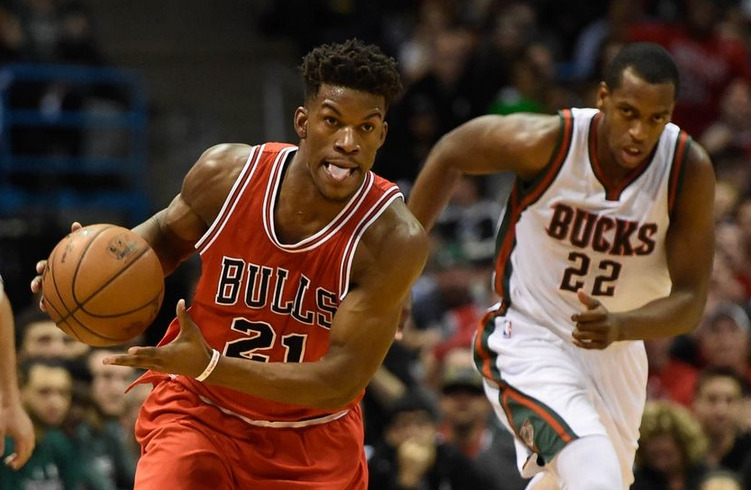 Jimmy Butler, Kawhi Leonard, Khris Middleton, Draymond Green, Tobias Harris, Brandon Knight and Reggie Jackson all signed 4 or 5-year max (or near-max) deals. In addition, Anthony Davis and Damian Lillard inked mega-extensions of 5 years - $145 and $120 million respectively. The only marquee names left are Enes Kanter, and Tristan Thompson (agreed to deal with Cavs, but talks then broke down). With any luck they'll take as much guaranteed money as they can. They would be foolish not to. The Kings absolutely embarrassed themselves early in the free agency period, before recovering and getting some salvageable pieces. But nothing can redeem them, or their eccentric owner after the show they put on. Lost in the fever pitch of the first day of free agency was the Kings' illogical trade of Nik Stauskas to the Sixers. I guess Vivek did a complete 180 on Stauskas, just a year after making the pick himself in the Kings' war room. And if trading a lottery pick after one year wasn't enough, they also gave away a protected first-rounder and the right to a pick swap. For a team that will most likely be in the lottery, they are essentially giving the Sixers two sets of ping pong balls in the coming years. If their recent luck with moves is any indication, one of those pick swaps will lose them the no. 1 pick. The worst part of the deal is how little value they got in return for Stauskas. After being linked to Ty Lawson for months, they could've managed to flip Stauskas and some picks for the point guard. As a Geroge Karl favorite, Lawson could've pushed the team up the ranks of the West. Instead, the trade gave away Stauskas as the cost of freeing up cap room. Room that they then used to throw huge contracts at Wes Matthews, Monta Ellis, and Tobias Harris. Matthews and Ellis both took substansial discounts in order to avoid Sacramento, while Harris didn't sign the offer sheet the Kings gave him. They were never in the running for the best names (Aldridge/Jordan), struck out on the second-tier (Ellis/Harris), and were forced to pick up whoever they could from the scrap heap. They settled on Rajon Rondo, Kosta Koufos and Marco Belinelli. For a team desperate to appease DeMarcus Cousins, these moves seem like hail mary attempts for the 8th seed. At this point we're a J.R. Smith signing away from the Kings being a sitcom. And that'll probably happen by the time I finish writing this. One of my perennial pet teams each year, Milwaukee looks like a young contender that's quickly rounding into shape. They bring back Khris Middleton, and add Grevis Vasquez and Greg Monroe to the squad. They even got some beautiful new uniforms and a new court design. For a team that went 15-67 in 2014, this is a fairly incredible turnaround. They trot out an intriguing starting 5 of MCW-Middleton-Giannis-Jabari-Monroe, and can easily win 50+ games in the pathetic Eastern Conference. I might feel stupid for saying this (especially after predicting the Hornets would win 50 games before last season), but I think the Bucks will win at least one playoff series next year. Their young players improve by the day (or in Giannis' case, by the millisecond), and I have a lot of faith in Jason Kidd to capitalize on their potential. I fail to see the logic behind signing Reggie Jackson to a 5 year - $80 million deal. Gaining trust with your own RFA's is important, but this isn't Anthony Davis or Kawhi Leonard. It's Reggie Jackon, a guy who has averaged just about a 13-5 the past two seasons. And while he upped this to 18-9 with the Pistons, he did so in just 27 games. Are they really prepared to give him roughly the same contract as John Wall? Regardless of how much the cap is set to rise, this is still an absurd deal. I can't believe any other team was close to $16 million per year. The Pistons are looking to move into a new-era of Josh Smith free basketball, and lock up their young players. I can't argue with the logic, but paying Reggie Jackson like a foundational player isn't the way to do it. Even if the Grit-n-Grind era never results in a championship, the Grizzlies' front office must be applauded for hitting on nearly every small deal they've made. This offseason was no different, as they acquired Matt Barnes for nothing, and upgraded their frontcourt while somehow saving money. Somehow getting Brandan Wright for 3 years - $18 million when Koufos got 4 years - $33 million is highway robbery. And with Marc Gasol re-upping for another 5 years, the Grizzlies can run it back for another year of contention. Outside of Kevin Durant, the upcoming crop of free agents is thin at the top. It is highlighted by Joakim Noah, Al Horford, Mike Conley, and possibly Dwight Howard (player option for 2016-2017). None of those guys are franchise-changers, and it doesn't get better beyond that. We could see teams hand out huge deals to the likes of Jeff Green, DeMar DeRozan and Wilson Chandler. The class lost out on serious star power when Kevin Love and LaMarcus Aldridge opted for longer deals, and when Davis and Lillard inked their mega-extensions. For restricted free agents, the class is headlined by (possibly) Andre Drummond, if he is not extended by the October 31st deadline. For teams looking to rebuild through free agency, it's going to be Durant or bust. There's just no other superstar-level max guys. As a depressed Clippers fan who still hasn't come to terms with DeAndre's departure (betrayal), I need to take my small pleasures. And seeing the Lakers have an even worse summer than their crosstown rival is certainly one of them. The team is delusional to think they can make the playoffs in the Western Conference, don't own their 2016 first rounder (top-3 protected), and humiliated themselves during a meeting with LaMarcus Aldridge. They couldn't even retain Ed Davis, a valuable backup who is still just 26. Their marquee signings were Louis Williams and Brandon Bass, who while valuable are still a far cry from their mystique of years past. They also acquired Roy Hibbert, who will provide solid rim protection without disrupting their cap space in the coming years. The Lakers are just waiting for Kobe's extension to expire, and for their young players to develop. Even if they're terrible this season (spoiler alert: they will be), top free agents will still meet with them. But in the meantime, Lakers fans can enjoy another season of awful basketball, only this time it won't even probably won't even pay off with a top first round pick.